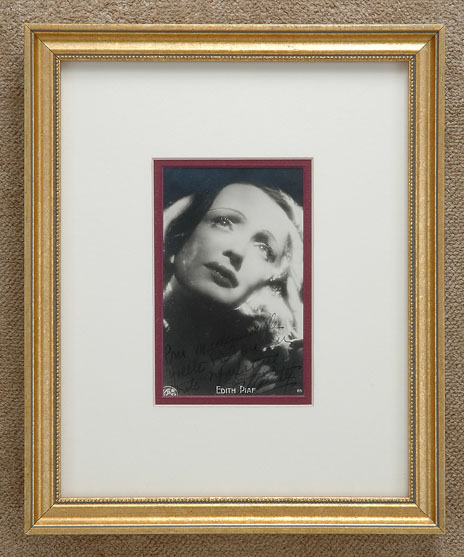 A vintage “real photo” portrait postcard of the legendary chanteuse in a wistful gaze, inscribed in the dark lower portion, Pour Mademoiselle Yvette Pichou en toute sympathie, Edith Piaf, undated . The postcard measures 3 1/2 inches wide by 5 1/2 inches high and is in fine condition. Framed in cream, ruby and antiqued gilt measuring 9 1/2 inches wide by 11 1/2 inches high.